Massaad ... Abu Dhabi is an important market. Wood Art Collection ... bestseller. RAK Ceramics of the UAE has recorded a 9.5 per cent increase in sales for tiles in its local market, bringing in Dh121.8 million ($33 million) in the second half of 2015, while sanitary ware sales increased by 6.7 per cent to pick up Dh36.4 million ($9.9 million). This represents an overall 9.5 per cent increase in H1 2015 earning the firm Dh242.1 million ($65.89 million) for tiles and 5.2 per cent increase in H1 2015 or Dh69 million ($18.79 million) for sanitary ware. RAK Ceramics has seen stable growth in recent years. This has primarily been driven by a combination of factors, including the implementation of a ‘Value Creation Plan’ to refocus on the company’s core businesses of tiles, sanitary ware, tableware and faucets in the GCC – and particularly in the UAE – and exit non-core, non-strategic businesses, according to a spokesman for the company. Additional contributors to RAK Ceramics’ profit included the launch of 25 new format tiles such as the Maximus Mega Slab, considered to be the largest manufactured tile in the region and a strategic entryway into the traditional granite market. 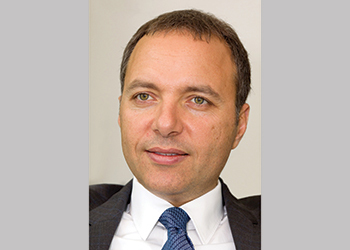 The UAE is the homeland of RAK Ceramics and remains its largest market, while Abu Dhabi is an increasingly important market for the company in terms of growth of demand and new projects, says Abdallah Massaad, CEO of RAK Ceramics. Backed by two showrooms in the capital that display its extensive range of products, RAK Ceramics continues to remain close to its customers and cater to their evolving demands and preferences. RAK Ceramics’ business is increasing across the UAE, propelled by an increased number of construction and massive infrastructure projects. The company has planned global sanitary ware expansions with an increase in production of 22 per cent in the UAE, 52 per cent in India and 25 per cent in Bangladesh, in line with its refocused strategy to support revenue growth by expanding high-margin core businesses. RAK Ceramics has also bought out the remaining 20 per cent minority share in RAK Iran, making the Iranian venture its wholly owned subsidiary. RAK Ceramics set up its Iran operations in 2003, which currently has three production lines with an annual production capacity of 9 million sq m. It has a long term vision for the Iranian market both domestically and as an export centre in Central Asia, as sanctions on the country get lifted. RAK Ceramics’ success is driven by two factors: high demand driven by a buoyant construction sector and its diverse range of products. The construction boom in the GCC over the past few years has created demand for high quality products, such as those supplied by the company for major residential and commercial projects in the GCC, as well as prestigious airport projects such as Dubai International Airport and Heathrow Airport in London, UK. The diversity of its product ranges in tiles and sanitary ware caters to the full spectrum of customer tastes and design requirements, as the company continues to innovate, regularly introducing new products in the region, such as the Maximus Mega Slab and the brand new waterless urinal and rimless sanitary ware range. Commenting on the regional construction market, Massaad says: “We believe the construction sector in the GCC is still witnessing heightened activity, driven by favourable demographics and world-class events such as the Expo 2020. Although there might have been a slowdown in the residential property market, this is primarily limited to a single segment in one emirate, in one country. “RAK Ceramics’ products are sold to a wide range of segments within the construction sector, including residential, commercial, industrial and hospitality, among others. Since the customer base that we serve is quite diverse, our exposure is not limited to one segment. Maximus Mega Slab ... largest in the region. “Similarly, from a geographic standpoint, RAK Ceramics’ products are sold in over 160 countries, providing the company with a wide and diverse market. Our market reach acts as a barrier to market fluctuations in any one country, limiting the potential influence of economic downturns in individual markets on our business,” he explains. In Abu Dhabi, RAK Ceramics has been involved in many flagship residential and commercial projects such as the Emirates Palace, Marina Mall, Sheikh Zayed Housing Project, Mohammad Bin Zayed City and Carrefour in Mussaffah. However, its major project contribution has been to the Ferrari World Theme Park in Yas Island, where it supplied Technochroma, a modern tile series that is available in 18 colours and two finishes – polished and satin. 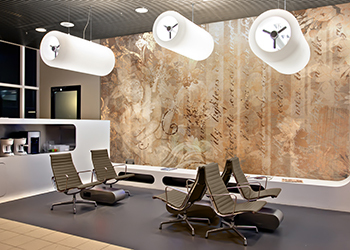 Technochroma boasts less than 0.5 per cent water absorption, which guarantees long-term durability and enables the tile to withstand heavy foot traffic. “The tile’s stunningly smooth edges and futuristic look were a perfect fit for the design requirements of Ferrari World,” says the spokesman. In terms of trends in the tiles sector, he says there is a clear trend in the market towards nature-inspired designs. “Wood Art, Stone Art, Marble Collection, Concrete Collection and Metal Collection are bestsellers and continue to meet customer demands, because of their ability to dramatically enhance the interiors and exteriors. These collections are eco-friendly, easy to maintain, durable, and more cost-effective than their natural material counterparts. They are well suited for use in both dry and wet spaces and are available in a variety of colours and designs,” he explains. 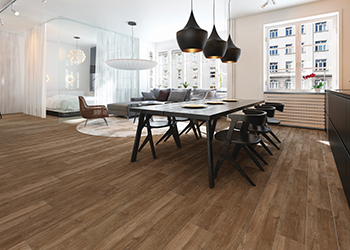 Among its innovations, RAK Ceramics has seen strong demand in the GCC, India and Europe for its new large-format tiles, because of their distinct finish and designs and the use of cutting-edge technology to produce them, says Massaad. These innovations are being showcased at international exhibitions and have garnered significant attention, primarily due to their cost effectiveness and easy maintenance, he says. As the leader in introducing new products to the market, RAK Ceramics will continue to invest in research and development (R&D) and new technologies to ensure that its products meet the evolving needs and preferences of its growing client base. RAK Ceramics continues to be a pioneer in hi-tech innovations such as digital technology, as well as robotic glazing techniques and high-pressure casting in sanitary ware. The company has also invested in new lines such as Luminous, the glow-in-the-dark series, and antimicrobial, an easy-to-clean hygienic tile that is especially designed for schools and healthcare facilities.